Global Electronic Warfare - Market and Technology Forecast to 2026, Market Forecast’s brand-new market intelligence study, brings you a number of unique features that you won’t find anywhere else. Chief among them are two independent forecast scenarios. The main Electronic Warfare (EW) competitors in each of the world’s market regions see capabilities quite differently from each other. Global Electronic Warfare - Market and Technology Forecast to 2026 introduces a unique new feature that graphically displays those regional differences. If the regions were roughly comparable, then the global averages for the three Electronic Warfare capabilities would apply across the regions. But they don’t. That fact strongly indicates that’s there’s more detail and insight needed to understand which EW capabilities are favored in each region. Only Market Forecast delivers that knowledge, which you need to lead this market. 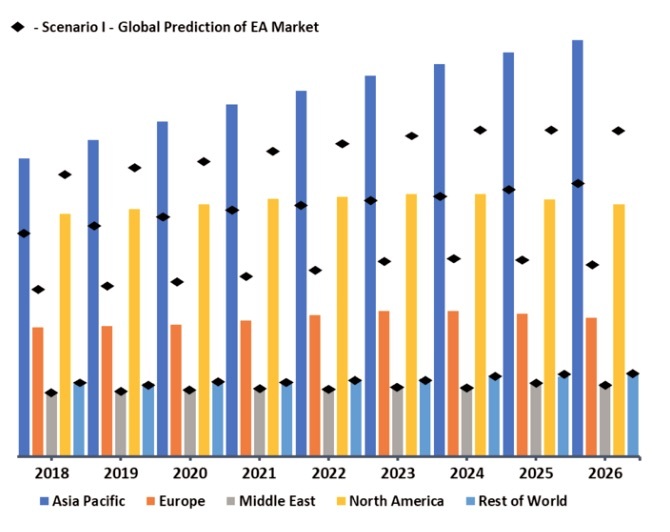 This sample shows the regional market forecasts for an EW capability over time with the global average indicated by the black diamond symbol. Where the market is relatively higher than that global market would predict, that region values this EW capability more than is the case elsewhere. If the market is relatively lower than the global average prediction, a region will not spend as much on this capability as less-detailed forecasts would tell you. The result? Global Electronic Warfare - Market and Technology Forecast to 2026, includes insights into these regional differences that will guide you toward opportunity and away from risk. Global Electronic Warfare - Market and Technology Forecast to 2026 explains open verses closed markets for these critical defense capabilities. This technology is so sensitive, so highly regulated, that simple forecasts are misleading. Following them will lead you to great risk. Some nations strongly prefer Electronic Attack while their targets are forced to emphasize Electronic Protection. That’s not a new story. But, the huge financial barriers and political embargoes at play in these markets further complicates that attack-defense reality into a confusing morass. Who may buy your systems? Do you want their currency? Will selling to them harm your sales in other markets? Can you operate in their market or is it closed? Etc. Global Electronic Warfare - Market and Technology Forecast to 2026 answers such questions and so will guide you to profit and away from risk. Company Profiles: The top manufacturers of the Electronic warfare equipment market have been identified and a detailed profiling of around 15 players have been covered in this section. Each profiling includes the revenues, recent contracts, strategic alliances, projects completed and SWOT analysis. 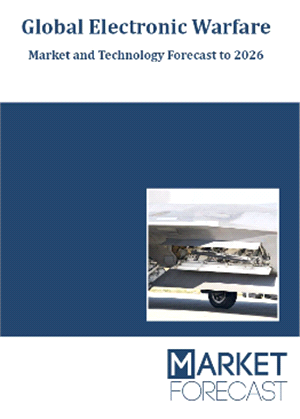 The key trends in the military EW market have been analysed in detailed, the Events Based Forecast chapter encompasses the possible market fluctuations. The market dynamics, which are the market driver, restraints and challenges have been covered in detailed. A Current and Near-Future technology overview chapter to get a thorough understanding of the future technologies that impact the market. Strengthen your understanding of the market in terms of key players in the market and their recent contracts, strategic alliances, financial information, etc..
Make correct business decisions by understanding the developments in the sub segment level that are expected to drive the future market. 1.7. Who Will Benefit from this Report? 2.2.2. The West Trails the East in Integrating EW Capabilities. 11.2. Aselsan Elektronik Sanayi ve Ticaret A.S.
11.11. Rafael Advanced Defense Systems Ltd.